I made lasagna Bolognese for the first time earlier this year using Smitten Kitchen’s much-acclaimed recipe, which author Deb Perelman called her “culinary Mount Everest.” It involved a considerable amount of work and was delicious. For whatever reason, though, I forgot about it until Bon Appétit published a fairly similar recipe in a recent issue. My interest in making the dish returned with vigor, and better yet, it was something I was actually excited to eat. 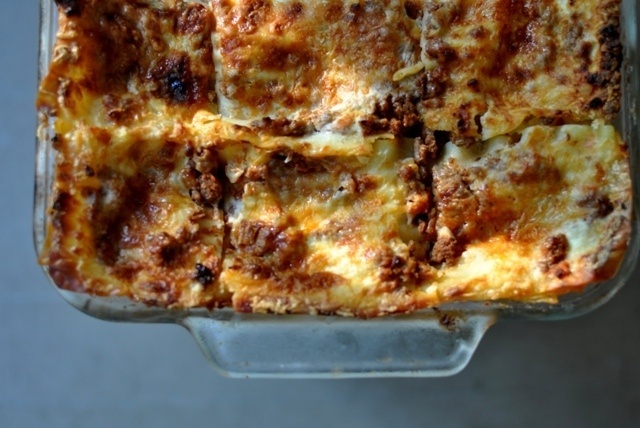 Lasagna Bolognese is lasagna supreme in my book. Think: a deeply flavorful meat-and-tomato-based sauce, creamy béchemal and freshly shredded parmesan, mingling together and bubbling between layers of pasta. The top browns beautifully, and I agree with Deb, the prized corner pieces with their perfectly cooked edges are worth fighting for. Not that I know anything about that. 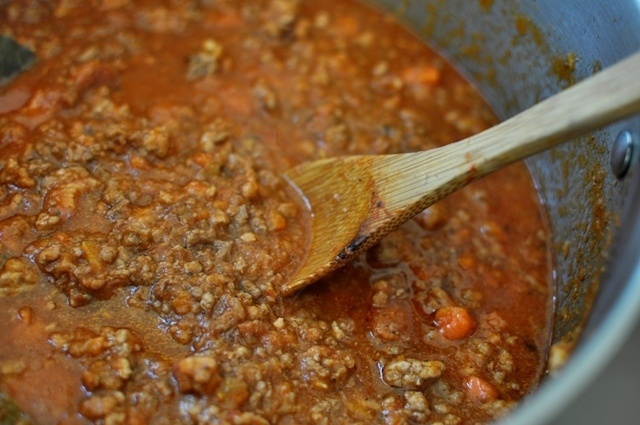 * Dear me, Bon Appétit’s Bolognese sauce is insanely flavorful with ground pork, ground beef and pancetta. I have to pull myself (and Jason) away from the pot when it’s cooking. Although you should have eight cups when done, I always end up with seven because of taste-testing during the cooking process (or quality control, as I prefer to call it). 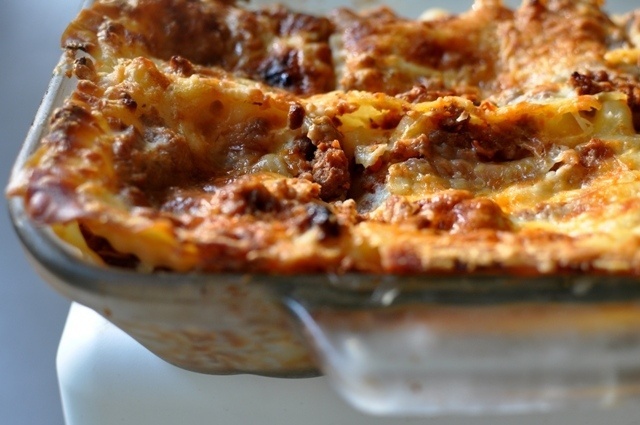 * Bon Appétit’s recipe calls for milk, a traditional ingredient in lasagna Bolognese. * Bon Appétit also offers a bounty of helpful tips, such as letting the lasagna rest for 40 minutes after cooking. The resting helps everything settle into place, and I’ve found even 20 minutes does the job. 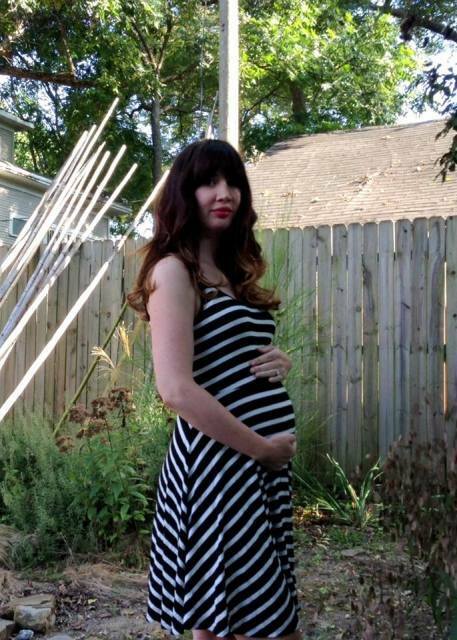 (Smitten Kitchen advises 10 minutes of resting time, which I would say is the minimum.) The first time I made the lasagna, I served it immediately out of the oven; it was difficult to cut and fell apart on everyone’s plates. * The béchamel sauce: you can’t go wrong with either version. * Smitten Kitchen’s recipe calls for red wine, while Bon Appétit calls for white. Red wine gets my nod. * Smitten Kitchen’s recipe calls for garlic. Yes to garlic; always, garlic. The recipe below is a combination of what I consider the best of the two with a much heavier emphasis on Bon Appétit ’s instructions and ingredients. I hope you’ll give me a pass for not including homemade noodles in this adaption, although feel free to follow the links provided if you want to go that route. I’ve made homemade lasagna noodles before and assure you they’re a worthy cause, but with the availability of quality pasta in stores, I think you can still achieve greatness here, not to mention make a lot of hungry people happy. This recipe calls for store-bought pasta, which is slightly thicker than the homemade version. For this reason, I increased the amount of Bolognese sauce, bechamel and cheese between the layers. If you want to make your own noodles, I commend you! I recommend following the instructions here (http://www.bonappetit.com/recipe/lasagna-bolognese#) or here (http://smittenkitchen.com/blog/2012/02/lasagna-bolognese/). 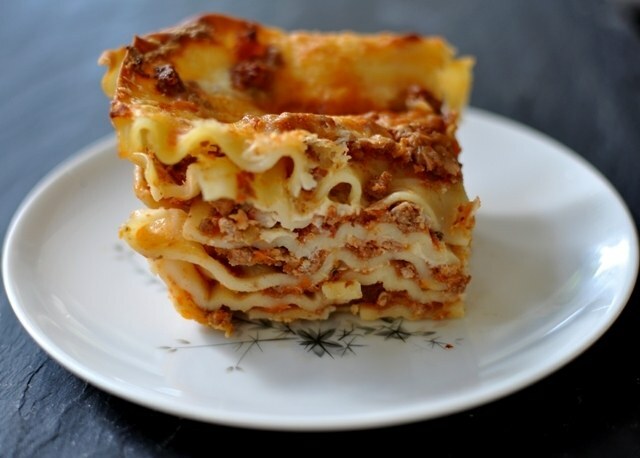 Just a reminder, because homemade noodles are thinner you will have more layers and will thus need to use less Bolognese sauce, bechamel and cheese between the layers. Add the onion, carrot, celery and garlic to a food processor and pulse until finely chopped. Heat the oil in a heavy pot over medium heat. Add the vegetables and cook for 5 minutes. Add the beef, pork and pancetta, cooking until moisture is almost completely evaporated and meat is browned, approximately 25 to 30 minutes. Add the wine and bring to a boil, scraping up any brown bits from the bottom of the pot. Simmer for 2 minutes. Add the milk and bring the mixture to a boil. Reduce the heat and simmer until moisture is almost completely evaporated, approximately 8-10 minutes. Add tomatoes and 2 cups of broth. Bring to a boil, reduce heat and simmer until sauce thickens, approximately 3 hours. Along the way you will want to add ½ cup of water at a time if the sauce looks dry. Season with salt and pepper. Let cool, then cover and chill at least 12 hours (to allow the flavor to deepen) or up to 2 days. Heat butter in a medium saucepan over medium heat until foaming. Add flour and cook, whisking constantly, for 1 minute. Slowly whisk in the milk. Bring sauce to a boil, reduce heat, and simmer, whisking often, until it reaches the consistency of cream, 8–10 minutes. Add the nutmeg and season to taste with salt and pepper. Remove from heat and transfer to a bowl. The béchamel can be made 1 day ahead and stored, covered, in the refrigerator until ready to use. When you’re ready to assemble the lasagna, have a large bowl of ice water ready. 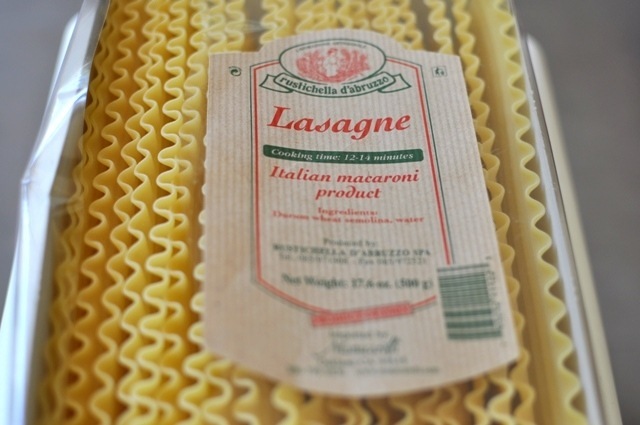 Bring a large pot of water to a boil and, working in batches, cook the pasta noodles according to the directions on the package, aiming for the lower range of cooking time so the pasta is al dente (just cooked through). Remove the pasta with a slotted spoon and transfer to the bowl of ice water for a few seconds. Remove the pasta and stack on a baking sheet with paper towels between each layer, making sure the noodles aren’t touching or they’ll stick. Preheat oven to 350 degrees F. Grease a 13x9-inch baking dish with butter. Spread ½ cup béchamel in the bottom of the dish. Top with a layer of noodles, spread 1 cup of Bolognese sauce, then a generous ¾ cup béchamel, and top with ½ cup parmesan. 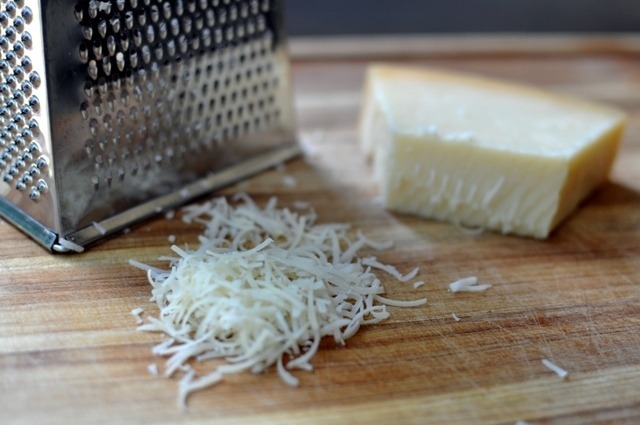 Repeat process, approximately 5 more times, starting with noodles and ending with Parmesan. (Note: you may have to cut a few noodles to get them to fit neatly in your pan. I like to alternate positioning the noodles vertically for one layer and then horizontally for the next to ensure the sauce stays snuggly between each layer.) 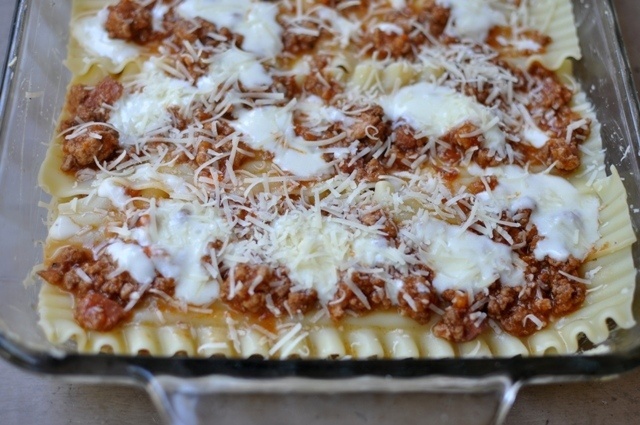 Bake lasagna for 50-60 minutes until brown on top and bubbling. Let lasagna sit for at least 10 minutes before serving, preferably 20. The lasagna can be assembled up to 12 hours ahead. Keep covered in the refrigerator. Bring to room temperature, approximately an hour, before baking.